Ulysses Bookstore: Hunter S. Thompson Fan? 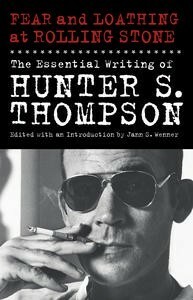 For the Hunter S. Thompson fans, a collection of his essays written for the Rolling Stone magazine has been compiled into a massive book of over 500 pages. Fear and Loathing at Rolling Stone starts with his first essay for Rolling Stone magazine - the story of his infamous run for sheriff of Aspen in 1970 on the Freak Party platform - to his last essay on the Kerry/Bush showdown in 2004, and includes many events and people which we of a certain generation heard about or followed first hand, including Muhammad Ali, Watergate and Vietnam.